"This would mean...that you've beaten up the 164 K record at HIGH pressure." Superconductors.ORG herein reports signs of superconductivity near 175 Kelvin at ambient pressure. This would be a new world record for a superconductor whose formula and structure are known. The proposed chemical formula is Sn1.4In0.6Ba4Tm5Cu7O20+ with 1245/1212 structure. Such a high Tc material was thought possible only after the discovery in 2005 of a superconductor that took advantage of planar weight disparity (PWD) to achieve its then-record Tc of 150K. The 150K material was based on a 1234/1212 intergrowth structure, which was counter-intuitive to conventional thinking about Tc-enhancement. Historically, increasing the number of CuO2 planes in the (Hg,Tl,Pb,Bi)-cuprates depresses Tc when the Ca-CuO2 layers exceed two. In PWD superconductors this limitation does not apply. As such, the next logical step was to attempt a 1245/1212 intergrowth (shown at left) - which contains one more Tm-CuO2 layer than the 1234/1212 structure. Tc-vs-PWR extrapolation (see log graph below) suggested such a material should produce a Tc between 160K and 190K. However, finding the 1245/1212 superconductivity signature within a multi-phasic bulk proved difficult, due to the small volume fraction that results. 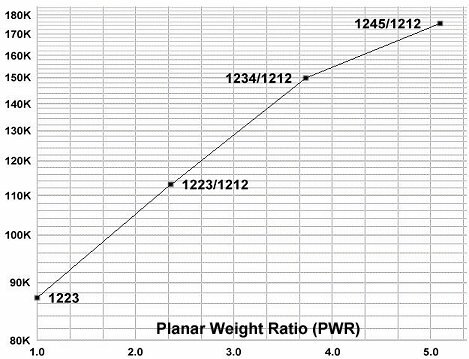 Very high planar weight ratios are not attainable by stoichiometric synthesis. They occur only as byproducts. So, a means needed to be derived wherein a minority phase of 1245/1212 material would occur in amounts large enough to measure within the bulk of a parent compound. Success was finally realized by increasing the amount of Tm and Cu by 5% in a 1223/1212 host. And, by increasing the ratio of Sn to In from 5:5 to 7:3. 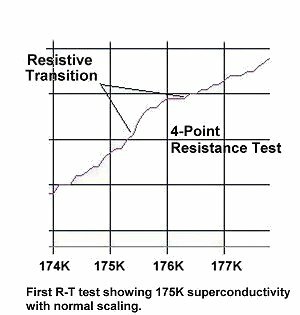 Four separate tests of the resulting material showed sharp resistive transitions near 175K, 174K 176K and 177K for the minority phase. Three of those plots are shown below and the fourth is at top left. Below is the plot of a composite magnetization test. The magnetometer uses twin Honeywell SS94A1F Hall-effect sensors operating at the limit of their sensitivity. 3 separate tests were performed and digitally summed together. This was done to improve the signal-to-noise ratio. Since the noise floor from each plot is out of phase with the other plots, they add together as a root-mean-square function. 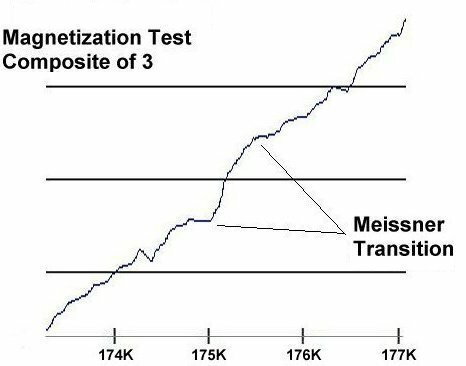 The Meissner transitions, however, are in-phase and sum arithmetically. 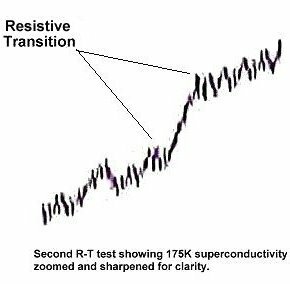 In fact, using this technique, it should be possible to resolve the superconductivity signature of a 1256/1212 phase, if one exists. The inclination of the Tc-vs-PWR plot (below) shows a lower angle approaching 1245/1212. This can be attributed to the 1245/1212 unit cell having 18 metal layers. Empirically, 16 layers has been found to be optimal. Thus, the 1245/1212 unit cell is slightly larger than ideal. 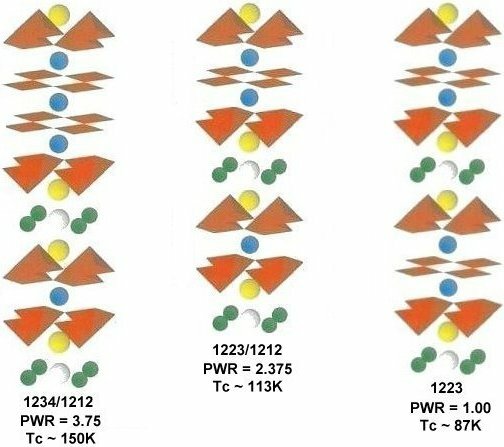 Below are the other 3 structure types from the Tc-vs-PWR plot. These members of the Sn-In-Ba-Tm-Cu family suggested the existence of an even higher Tc material between 160K and 190K. Synthesis of the material was by the solid state reaction method. Stoichiometric amounts of the below precursors were mixed, pelletized at 70,000 psi and sintered for 36 hours at 830C. The pellet was then annealed for 10 hours at 500C in flowing O2. RESEARCH NOTE: Tm-copper-oxides have been found to be strongly hygroscopic. All tests should be performed immediately after annealing.